This first two comments provide a summary of all issues. For details of each bug, please see the follow-up posts. If a developer would like more information regarding potential exploits, please PM me. When a power bug can give a player a significant and potentially unintended advantage, that bug may be considered an exploit. Please do not post exploits publicly. If you would like to mention such a bug (or are wondering whether a bug may fit exploit criteria), PM it to me to err on the side of caution. I'm keeping track of such bugs on an unposted list that will be sent privately to the developers. If you would like to add a forum-safe bug to the list, feel free to post it in a comment or a PM. If you would like to argue an opinion about a particular bug, please keep your argument brief and limited to a single post. I appreciate everyone's passion for power performance, but I would prefer to keep this thread neutral in opinion and avoid prolonged debates. Once both sides of an argument are presented, the final decision is up to the developers. When used against a target currently under the effect of Negative Ions, Thunderstrike frequently reapplies-then-consumes the buff, rather than consumes-then-reapplies. This leaves the target without Negative Ions, which is contrary to the power's description. When used after some animations (particularly animations that use both hands), the visual effects for Lightning Arc sometimes emanate from both hands simultaneously. Ranks 2 and 3 of Conflagration receive no boost from the Qwyjibo's Fury mod. Rank 1 behaves properly. Crushing Wave is the only ranged maintain that cannot trigger Concentration by means of maintaining it. Concentration does not count the initial activation tick of maintains toward its "4 ticks to trigger" total. Because Crushing Wave only has 3 damage ticks after the activation tick, it is incapable of triggering Concentration using this method. Recommend adding one additional damage tick to Crushing Wave's maintain. Note: Crushing Wave is able to trigger Concentration by hitting a target beyond 25 feet away. Personal Force Field's shield regeneration does not increase when under the effects of a Burst alert. Additionally, its total shield value appears to fluctuate during Burst alerts. PFF's regeneration rate, particularly the bonus rate when blocking in combat, appears inconsistent. The tooltip says the crushing damage buff stacks up to 10 times. In practice, it can stack well into the hundreds. Every individual application does increase crushing damage, not just the first 10 stacks. It is unclear whether the erroneous element is the tooltip or the power's performance. When charged during a jump, Updraft's animation suggests a mild case of demonic possession. A while back, patch notes indicated that Quarry's Audacity stat bonus to INT and EGO was capped at a new value of 20 per stack (60 total). The in-game description reflects this new value. But in practice, Audacity still retains its old cap of 30 per stack (90 total). Focused Shot does not immediately lock your character's movement the same way that Sniper Rifle does. As such, if a character is moving at the start of the activation (even just a little), the charge will cancel. This interruption condition is not mentioned in the description, and is presumably not working as intended. Sonic Device's description suggests that it will always apply its stun to a target. When using a targeted AoE, Sonic Device will only stun the anchor target, and not the additional enemies. When using an untargeted AoE, Sonic Device will not stun anything. If this is working as intended, it is recommended that the power description be updated to reflect this phenomenon. Cooldown reduction reduces the amount of time taken off with Nanobot Swarm. If a player is hit with an untimely knock or hold with an on-next-hit ability (Miniaturization Drive, Sonic Device, or Toxic Nanites) ready to fire, it sometimes does not activate, and will no longer activate until the ability is re-used. Last I heard [which I admit was years ago now, back in Beta] this bug was rooted in a tiny and almost imperceptible delay between a power being activated and actually 'going off' and applying it's buff or other effect, and MAY be due to basic connectivity issues, I.E., seen more often for people with long PING times. Back then, I was told that the best fix they had to powers activating and entering cooldown but not actually going off due to CC or Knocks, was trying to tighten up this imperceptible delay as much as possible, and I believe that was done. I think now it happening still are tiny edge cases slipping by even after all that was done, or just really unlucky timing. Power Bolts is not flagged to receive bonus damage from Targeting Computer. Overdrive's description suggests that it scales primarily with Intelligence/Endurance, with a minor impact from Recovery. In practice, it scales primarily with Recovery, with a minor impact from Intelligence/Endurance. The description should be flip-flopped to reflect this order of importance. Lightwave Slash is incorrectly labeled as a Bleed in its description. While Plasma Burn offers stacking damage-over-time (like a Bleed), it is not mechanically the same as a Bleed. 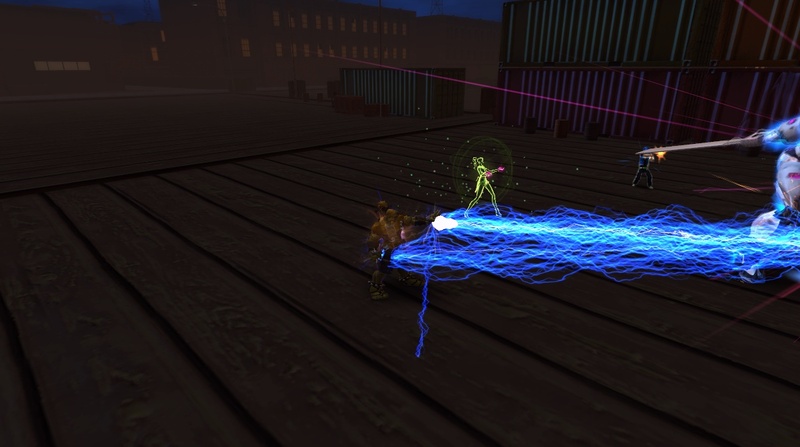 Particle Smash's description refers to it as a Ranged attack, but it functions mechanically as a melee attack (receives a damage bonus from Strength and Melee role, et cetera). This description is unclear.​​ It is also placed in the Close Attack category, but should probably be moved to Close Area Attack. Form of the Swordsman's advantage, Cut Where it Counts, does not work at all times. The debuff will simply not be applied under certain circumstances (no icon or heal debuff to the target). This bug occurs when you activate the form then enter any new instance. The current workaround is to reactivate the form each time you change instances. Ego Blade Breach and Ego Blade Annihilation are both melee charge attacks, but do not trigger this form. Sneak's basic description (which is apparently the description of the old Sneak power) mentions a 15-second recharge when coming out of stealth. This conflicts with the current mechanics and the advanced description, which cause a player to re-stealth after 4 seconds. Sneak's basic description states that entering combat removes you from stealth. The advanced description mentions four conditions that break stealth, but does not include all conditions that cause a player to enter the Combat status. This is a description conflict, but it is unclear whether the omitted conditions are intended to leave a player in stealth. When not using a martial arts toggle form, the Stinging Bee advantage will not refresh the duration of the Focus buff after applying it. The Chained Kunai advantage changes the power's animation to generate a line emanating from the user's foot. This animation is very unusual, to the point where it is assumed to be a bug. This power should trigger Concentration if the target is more than 25 feet away or the power is charged more than halfway. Currently, neither of these conditions triggers Concentration. Telekinetic Burst does not receive a damage increase from any toggle forms, except for Mental Discipline. Telekinetic Assault's "flying daggers" graphic effect frequently does not activate, particularly when used immediately after another animation (even right after its own animation). Explosive Potential calculates its damage based on Telekinetic Assault's base rank, not its current rank. If Telekinetic Assault is at Rank 2, Explosive Potential does less than the listed 2/3 AoE damage. The AoE damage is also unaffected by Defense Penetration specs and gear. The description states that the final attack of the Ego Weaponry combo hits twice. This description is incorrect; it only hits once. It is worth noting that the description for the Id Weaponry combo properly indicates that the final attack is a single hit. Kinetic Darts is the only energy builder that triggers Concentration when executed at least 25 feet from a target. theravenforce suspects that it is inheriting this non-energy-builder property from the NPC version of the attack. Telepathic Reverberation sometimes fails to trigger at all. This happens most frequently during the Gravitar and Fire and Ice rampages. A player seems to have a better chance at triggering it when located closer to the enemy. The exact cause of this bug is currently unknown, but players have expressed a couple theories. One theory is that the visual effects may be low-priority, and fail to be created when 10 players are spamming their own graphical effects. Another theory is that Telepathic Reverberation creates an object that is being destroyed or impeded by area-effect attacks. In PvP, Telepathic Reverberation's GFX inherit the color of the power that triggered it. In PvE, the GFX are always a default blue. Against Cybermind, the color is pink. Ego Damage Resistance from Congress of Selves does not reduce incoming Ego Damage. The resistance penetration offered by Congress of Selves does not do anything. The description of Congress of Selves indicates that it increases Ego Damage over Time, but in practice it boosts all Ego Damage. * These powers apply their control through a separate entity, and may not be intended to trigger Manipulator. The power Ice Cage does trigger Manipulator. However, many other powers in the Ice framework can potentially create an Ice Cage on a target, and these powers do not trigger Manipulator. It is unclear whether they should. This power's tooltip suggests that Dependancy heals multiple allies. In practice, it only heals a single ally or oneself (whoever is closest to the target, up to a maximum range of 15 feet). Mental Leech's tooltip correctly mentions the Mental Weakness debuff, but the description at the Powerhouse trainer still references the old Interrupt mechanic. Rank 1 Mental Leech does not have any sound effects. Mental Leech's graphic effect on hit (the burst effect that radiates from the primary target) does not obey color tinting. It is always pink. Shadow of Doubt's tooltip states "When Mental Storm expires". This should be changed to "When Shadow of Doubt expires". Shadow of Doubt's tooltip correctly mentions the Malaise debuff, but the description at the Powerhouse trainer still references the old Interrupt mechanic. Shadow of Doubt does not have any sound effects. Ranks 1 and 2 of Mind Break do not have any sound effects. The Mind Opener advantage states that it increases damage by 30%, which is similar to other descriptions which multiply the power's base damage. In practice, the power deals a separate tick of damage equal to 30% of the maximum charge damage (like Ice Blast's Hard Frost). If this power is working as intended, recommend changing the description to mimic Hard Frost's, to avoid confusion. This power's tooltip indicates a range of damage, but the attack automatically charges to full whenever it is used. The charge cannot be interrupted by a block, and will only stop partway through if the character does not have enough energy to execute a full charge. Lance Rain is not flagged as an AoE attack for specializations such as Locus and Round 'Em Up. It is also not flagged as a Mentalist power, for abilities that give cost discount to Mentalist powers (such as Ego Form). Rank 3 Id Blade Breach (using the two-blade animation) plays Onslaught Medusa's voiceovers. The closer your camera is to your character, the louder the voiceover becomes. Medusa's voice knows no gender boundaries, and will also play for male characters. This power does not have any sound effects. Since all other powers possess a sound effect, this is assumed to be a bug. The charge animation on Annihilate overwrites its own hit animation when doing consecutive charge attacks. Land Slide is incorrectly labeled as a Disorient in its description. It should be labeled as a Stagger. Seismic Smash's description refers to it as a Ranged attack, but it functions mechanically as a melee attack (receives a damage bonus from Strength and Melee role, et cetera). This description is unclear. The Endorphin Rush advantage's description erroneously states that its duration is influenced by Defiance. This is a leftover description from old power mechanics. Aggressor does not give extra stacks of Enrage when the Aspect of the Bestial form is active. Roomsweeper is capable of building Enrage stacks when an object is nearby, but is occluded by other geometry. Ranks 2 and 3 of Beatdown do correctly increase its damage. However, they also add a superfluous 0 Slashing damage to the first two hits. The damage bonus from Blindside Blow against rooted or snared targets does not appear to be functioning. The Meteor Hammer advantage does not behave the same way it does on Lash. Iron Chain's Meteor Hammer always uses Rank 1's damage, making Rank 2 and the charge (in terms of damage) irrelevant. When tap-spamming this power, the duration of the arm animation does not coincide with the power's activation time. This means that, frequently, the second attack will fire a chain from an idle animation position. The damage buff on next attack from these powers is adsorbed by ongoing DoT ticks like Ego Sprites. For example, a player blocks and gains the Retaliation buff, then casts Ego Sprites. Every DoT tick is correctly increased. But if that player gains the Retaliation buff again while the DoT is active, a DoT tick will consume the buff but receive no damage increase. When the third attack hits multiple enemies, it applies multiple stacks of the Defiant buff, instead of just one. Radiance does not proc the Twist Fate specialization on any target. Radiance does proc the Exhausting Strikes, No Escape, Initiative or Can't Touch This specializations on a friendly target when healing them. Exhausting Strikes and No Escape can also proc on your own character. Radiance uses a grounded animation when healing yourself or allies from a flight pose. Rebuke is not properly functioning as a Blast attack. It does not work with Blast-related specializations such as Avenger Mastery or Preemptive Strike. It also does not consume Preemptive Strike, as a non-Blast attack would. Rebuke probably has 3 relevant parts as far as the game is concerned, one part the damage effect, one part the heal effect, and one part that activates on of the two other effects depending on the target. The power itself is probably tagged as a blast attack, which stops the Preemptive Strikes spec to be consumed, but the damage dealing part of the power is not tagged properly as a blast, so non of the blast specs work on it. The bonus health granted by Conviction does not work as the description suggests. When you receive damage, the game subtracts the amount received from your Conviction-buffed health, then calculates your percentage of current health relative to the buffed total. It then sets your health to that percentage of your unbuffed total health. For example, let's say a Conviction-buffed character has 10,000 total health points, including the buff. That player then receives 1,000 damage. This would reduce the player's health to 9,000, which is 90% of 10,000. The game then sets the character's maximum health back to its original value, and sets the player's current health to 90% of that total. In practice, the health buff absorbs a negligible amount of damage, and does not operate as the description implies. When increased to Ranks 2 and 3, Conviction loses its sound effect. When Iniquity is cast on a target, the "flexing" animation it triggers overrides a variety of different animations that the target may currently be executing. The target's power still activates, but without an animation. This creates scenarios where players end up thwarting villainy with "invisible" attacks. Imbue's breakfree damage is improperly scaling with the health of the player instead of providing an amount consistent with other Active Offense powers. The breakfree damage seems to be linked to Imbue's scaling Crit/Severity bonus. For example, when Imbue offers +12% Crit/Severity, it gives 12 (an inconsequential amount) of breakfree damage. Imbue seems to provide the proper amount of breakfree damage against only the Root status. Palliate's description states that is cannot critically hit. In practice, it can. Palliate benefits from healing bonuses. Since there are no other percentage-based healing powers for comparison, it is unclear whether this is working as intended. Gaining Compassion stacks is unreliable if your heals are stronger than the health your target is missing. Compassion does not work at all with Bionic Shielding. Compassion's description states that you gain an additional stack when healing an ally. For the sake of clarity, this should state "yourself or an ally". When a non-flight travel power is active during Ascension's effect, Ascension's vertical movement is limited. When a grounded travel power (superspeed or rolling variants) is active during Ascension's effect, lunges and reverse lunges (Evasive Maneuvers and Breakaway Shot) do not move the character forward. When there are two AoRP users on a team, any allies affected by two simultaneous AoRP auras are unable to reduce damage by blocking. The block animation still plays and stuns can still be blocked, but damage is not reduced. When first applying AoPM, the power grants its listed stat bonus. A few seconds later, it will slightly increase this stat bonus. It is possible that the power is buffing itself, and the buffed value is not reflected in the power description. Rank 2 of this power provides no damage increase compared to Rank 1. March of the Dead is the only pet power that still uses the pre-On-Alert stat scaling for pets. Intelligence increases damage, and Presence increases health. March of the Dead pets do not benefit from superstats, and do not inherit Crit/Severity from their owner. When activating Skarn's Bane mid-jump, the graphic effects emanate from where the attack started, and do not follow your character even though the area of attack is dependent on your current location. Although this is a GFX bug, it admittedly looks pretty cool. The self-only charge time reduction of AoAC scales only with Presence, instead of via superstats (like the self-buffs of other auras). This pet's description indicates it will generate a Power Charge "as your familiar battles your enemies". In practice, only its melee attacks generate Power Charges; its ranged attacks do not. This becomes an issue when the familiar cannot reach an airborne target, becomes stuck in geometry, or glitches to only cycle its ranged attacks. Arcane Vitality's visual effects disappear after it is ranked to 3. This only happens when casting it on yourself. Ranks 1 and 2 work fine. The Virulent Propagation advantage does not accurately refresh the poison stack. Although the icon under the target's portrait will indicate a refreshed stack, that poison stack will frequently not deal damage. This appears to be tied to whether or not Infernal Blast triggers its own poison application. When it does (a 25%-100% chance, depending on charge time), the refreshed stack will deal damage correctly. When it does not, the refreshed stack will not deal damage. Rank 1's animation does not align with the character's hand position. Ranks 2 and 3 do not have this problem. Aspect of the Bestial Rank 2 and 3 do not apply additional stacks. Frenzy is labeled as a Combo in its description, but is not impacted by combo-related specializations. Massacre refreshes Bleed effects but does not have this labeled in the description. The power is apparently working as intended, and the description is the erroneous element. Massacre's left-handed animation uses grounded foot placement when executed in the air or underwater. The "scratch" GFX also does not play during those circumstances. Massacre's "scratch" GFX do not properly align with the arc of the slash. When flying or underwater, Bestial Fury sometimes throws punches instead of slashes. When the movement animations for travel powers are refreshed after being overridden by another animation, they are occasionally replaced by a rapid walk animation. Disconcerting for an on-the-move champion, but handy if you're re-enacting a Benny Hill skit. The description on Millenial Flight shows the exact same flight speed as any other flight power, but it is a lot faster. It has a fourth gear that is not shown on the tooltip (it can be seen by dragging the power into chat). Its first three stages are identical to equal rank flight, and work in exactly the same way. It's fourth stage activates after a few seconds of moving (all other stages can be activated by just standing still and waiting, or by full charging the power) and ends if you come to a stop, and gives the same speed boost as the previous stages -- thus, normal R1 flight is 20 + 17 + 17 = 54, millennial flight, after the speed boost kicks in, is 20 + 17 + 17 + 17 = 71 (r2 is 88, r3 is 108). As a side note, the fourth gear also has a separate vfx, and by playing around with powerhue you can get two-colored millennial flight while in fourth gear. Energy Slide grants no movement bonus underwater. When activating a self-rooting maintain during flight, the character's legs do not default to the static flight pose. This can cause the character to don an unusual "in-motion" leg position while remaining still. When using a flying travel power and moving above the base combat speed, the flying animation overrides the block animation. After you have stopped moving, it takes about a second for the block animation to start. This happens if you used your block while you were still moving, and also if you block for the first time after you have stopped moving. Any consecutive blocks will animate properly until you move again faster than the minimum flight speed. When moving forward or backward, Ninja Leaves drags you down, as if by gravitational force. While Bat Flight is active underwater, player powers can still be used. This is not the case on land or in the air. The Flippin' advantage does not always provided its listed increase to Dodge%. As a player's dodge percentage increases, Flippin' seems to provide less of a bonus. While in the Tunneling state (and those of its variants), the blue arrow above the character's head (which denotes primary mission location) disappears. Tough only grants half the expected amount of health. Its description promises 0.5 health per rank (per secondary superstat), but it only delivers 0.25. Wither does not generate a debuff icon on its target to indicate when the specialization is active. Rejuvenated does not work with most heal-over-time effects. * Mend does not trigger Rejuvenated probably because Mend isn't technically sourced from you, but rather from the debuffed target that your ally was hitting (like Sentinel Mastery). Eternal Spring does not work on self-heals. Description indicates it heals 2% of maximum health. In practice, it heals 5%. One of those values is incorrect. Ego Storm (Malevolent Manifestation) * Note: Without the advantage, Ego Storm triggers Sentinel Mastery. * These powers apply their control through a separate entity, and may not be intended to trigger Sentinel Mastery. The description does not mention how much damage increase is granted to the next melee attack; it simply displays a % symbol. It should say 10%. Upper Hand's description claims to increase Melee damage when certain conditions are met. In practice, it does not appear to directly increase the damage of melee powers, but instead increases their critical hit rate. Exploit Opening adds a static 30% severity. The tooltip states that it adds "30% of your severity". This specicialization does not appear to add any dodge bonus. When activating a vehicle device, the order of the slotted weapons in the hotkey tray randomly changes. This makes it difficult to memorize the correct attack hotkeys when using a vehicle. The vehicle weapon Flashbang requires you to center your camera on your target. If not, the charge will always interrupt. The Nightmare Generator device tends to overwrite attack animations with its summon animation. Neuroelectric Pulse Generator knocks targets back, but does not apply knock resistance. Changing instances freezes the cooldown countdown of devices in your inventory, but not in a tray, until you put them back in a tray. Devices with a fixed cooldown (which recharge with the shadowed bar draining downward) show tooltip timers that are influenced by cooldown reduction. In prctice, they are always set at a fixed recharge time. The global cooldown on Active Offenses and Defenses is affected by cooldown reduction. This altered global cooldown is not reflected in the power descriptions. Either the static description or the reduced cooldown is erroneous. Flat damage reduction from Inertial Dampening Field or Invulnerability only works for a certain number of hits when a shield (such as Protection Field) is active. After that point, the shield takes full damage from subsequent hits, as if the flat damage reduction has no effect. Tests conducted by aiqa show that the number of hits is inconsistent before damage reduction failure. This suggests that the bug is linked to a different factor, such as total damage absorbed. Pets frequently enter a state where they no longer attack. They simply stand idle at their target's feet. Resummoning the pet sometimes temporarily fixes this bug, but not always. If you have an ally targeted during combat right after a pet is summoned, the pet will detect that ally as its target and loiter at your ally's feet. This does not appear to happen outside of combat. Pets do not receive the buff from Burst alerts. This makes them rather useless in such encounters. One Hundred Hands (second hit per maintain tick) Note: The Ghostly Strikes advantage correctly applies its Defense Penetration to the second hit. When a power creates a separate entity, or a damage-over-time debuff, that damage in unaffected by Defense Penetration. When a bubble (such as Protection Field) is used on a character who is carrying an object, the bubble animation surrounds the object instead of the player. When the object is thrown, the bubble travels with it. Certain single-application timed buffs can be stacked by re-using it after changing zones. Some powers' applied buff or debuff is immediately cancelled if subsequent uses of that power are interrupted. For example, a completed Thundering Kicks combo applies a dodge buff. If another Thundering Kicks sequence is initiated while that buff is active, then cancelled mid-combo, the buff will immediately disappear. Concentration, Manipulator, and Compassion do not count toward unlocking higher-tier powers in their respective powersets. Rising knee and tractor beam do not respect knock resistances. Copy-paste from my old bugs thread, so it may contain duplicates with this threads bugs list. 1. Sonic Device and Thunderclap don't stack Manipulator toggle. 2. Inexorable tides should but doesn't get additional damage on knock resistant targets. 3. Minidrive had scaling movement speed debuff before, now it's gone for some reason. 4. Nanobot swarm's effect is still reduced by your own cd reductions. 5. Summonable entity powers are not capable of crits. 6. Decimate got additional 0.5 sec activation time. 7. Uppercut advantage is super buggy old hold. 23. Ego Blade Dash has scaling root, unlike Thunderbolt Lunge, where root duration stays the same regardless of rank(which is more useful for lunge-type powers imo) and was it a mistake of giving that lunge Disorient advantage? it doesn't synergize with power set at all, imo disorient advantage should be changed to Ego Leech granting advantage, because currently melee tk's have no reliable ways of stacking ego leech without picking ranged tk powers. 30. Implosion's engine reverse repel no longer scales with power rank, while it did before. This never got fixed. 32. Burning chi fist's dot should probably ignore shields and resistance fully, cos otherwise it's useless. 37. Unfettered Strikes advantage on Masterful Dodge procs only once, and not each time when you dodge, like description states. 39. Thundering Kicks are not considered a combo attack. 41. When switching from 1 travel power to another with a charge, old travel power now instantly shuts down (started happening after that double travel power patch), making you fall from the sky quite often as a result. 43. Enrage doesn't improve bleed damage. 44. If you take any +pet damage specs, it makes sorcery sigils do 0 damage in all cases. 45. Endorphin Rush advantage on Enrage doesn't heal you on first tick, only on 2nd and 3rd one and now it doesn't scale it's duration with defiant stacks on you. 47. Sometimes, when 2 knocks are used on enemy player in quick succession, your enemy becomes immune to knocks after 2 stacks making all consecutive knocks just refresh immunity. This makes your enemy fully immune to knocks untill you or anyone around u stop attempting to knock that target for 15 seconds, which is impossible with uncoordinated teammates. 48. For unknown to reason any stunning power can sometimes default it's duration to 1 second, even if you have 12 seconds base stun duration, making all this +hold duration stacking done by player worthless. Happens only vs players. Would be nice if somebody did more testing on this one cos my tests didn't uncover a reason for this behavior. 49. Aura of Arcane Clarity's +Chargespeed does not scale with Super-stats, instead scales with PRE. 50. Personal Force Field is regening incorrectly during combat. 53. Sniper Rifle can't stun targets outside of 100 range. Device cooldowns don't scale with cooldown reductions or Int, even though tooltips show their reduced values. This includes devices like Neuroelectric, Ice Grenades, Willf ot the Tiger, Amazing Grace, Numbus of Force, Psionic Surge(this one could use reduced cooldown too), Omicron Inducded Str. and so on... I don't have all devices to list everything. Psionic Accelerator uses old hold mechanics, can't crit, got boss *foom* message above your head. Ice Grenades disable all flying powers and disable ascension. Eruption provides immunity to all dmg in a form of 50k damage absorption shield and disables flying powers and ascension. Perpetrator Incapacitation Devices sometimes stuns for less than 1 second on players. While it's stun duration on NPC's is around ~3 seconds. Aoe spec Brush It Off from Dex, doesn't work. Tough talent in Con spec tree is scaling only for half strength. Physical Peak in Str spec tree doesn't affect many melee powers, like Devour Essence for example. Some +stat Masteries don't account for your passive improvements, for example when i pick str mastery, my aura of primal majesty gives 75 stat points, but if i would switch from str to ego mastery, it would give me only 74 stats. Wither from Sentinel tree could use an icon to show when it's working and it doesn't improve damage of other players. Rejuvenated from Sentinel spec doesn't work with 90% of HoTs, like bountful chi or endorphin rush and doesn't scale with any stat. Eternal Spring from Sentinel spec doesn't work with Conviction. 1.Animation of TK assault doesn't show in 90% of situations. 2.Devs forgot to turn Aspect of Infernal and Aspect of the Bestial auras into a legacy ones. 3.Roomsweepers animation keeps repeating after it applies enrage to you. 4.Block animation being played each time you dodge with LR. 6.Superspeed forward jump animation got bugged at some point and now simply plays run forward animation instead of jump animation. 7.Doing backflip jump with acrobatics while being assaulted by attacks makes only your lower body do backflip animation, leaving top half stuck in *being hit* animation. 8.Ice Sheath doesn't apply any aura, unlike other active offences. Quality of Life stuff, cos there's no other thread that devs read to put it. 1.OV medusa can use her melee attacks without anything targeted, such behavior would've been amazingly useful for all player melee powers too. 3.Would be nice to have an option to have dual ego blades advantage on each ego blade power instead of being forced to use pretty weak passives or toggles. 4.Epidemic's animation could use improvements, old one that we saw on PTS was much cooler than current flying pieces of ****. lol. Gonna add more bugs to this post in future. Absolve advantage on Palliate doesn't give 10 sec stealth or wipe threat anymore. Was working fine before now it got bugged for some reason. 1) Ice wall (and I wager ice cage too) do not trigger specializations that activate on rooted, such as trapped! 2) If you activate ice wall via target reticule without at target it sorta just sits there in front of you and doesn't track to target. 3) If you activate ice wall via a targeted ally it will track the ally instead of their target. Bug: Activating the Tunneling travel power (or its variants) removes the blue direction arrow to your primary mission. The arrow returns when you deactivate the power. This is a real hindrance, I hope it can be addressed. I'm not sure when it appeared. Please let players temporarily turn off XP! Long Time Bug! : Ninja Leaves doesn't work properly if it's activated during the slow fall phase. Instead of being able to just fly freely like the initial activation you just plummet to the ground. More than certain this wasn't intentional!